Did the deceased have any enemies? Did he now! Everyone from his main foes the Israelis to rival Arab leaders to many of the leaders on his own side could be included in that large club of Arafat’s enemies. Poirot was familiar with those facts but he wanted to hear Mrs Arafat’s version. With his typical meticulousness, Poirot decided not to dismiss the widow as a suspect, despite that fact that she had hired him. 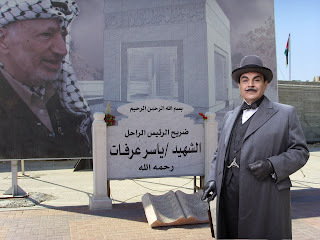 Arafat’s main enemy and the chief suspect was lying in a coma not very far from where Poirot was talking to Mrs Arafat. Ariel Sharon had tried to assassinate Arafat several times before and had talked openly about it. But it was impossible to get any answers out of him now. Poirot’s only option was to talk to his successor and close ally Benjamin Netanyahu, a man who had hated Arafat and wanted to get rid of him as badly as Sharon. “Yes, that is more your style, we all know your trademark. But there would have been bigger consequences. Are you denying that it was convenient?” Poirot was visibly rattled by the impertinence of the other man. “We can’t be held responsible every time someone dies conveniently for us.” Replied Netanyahu with a grin. He was clearly enjoying this. Still, Poirot thought, one must keep an open mind. Poirot was scheduled to meet Arafat’s successor, Mahmoud Abbas, in half an hour. An ambitious man but without the personality to match, in fact some say with hardly any personality at all, he was also an obvious suspect. He would benefit from replacing Arafat and would serve the interests of external powers. Poirot decides on a line of questioning. Poirot interest is momentarily raised by the sight of Abbas’s moustache, but the thought quickly dissipates. The man's moustache is a disgrace; he clearly doesn’t take good care of it or use any ointments. It’s a hairy mess above his lip that is hardly deserving of the name. “Did you assassinate Arafat?” Poirot’s first question comes out as a surprise to them both, reflecting Poirot’s irritation with the man’s messy facial hair. On the way back to his hotel, Poirot goes back over the facts. He decides there’s one more suspect he needs to talk to. It will be impossible to visit Damascus so he arranges a telephone call with Bashar al-Assad. The Syrian rulers were old enemies of Arafat and had always tried to cut him back to size. Poirot decides it’s best to go for the soft approach. “This is clearly a Zionist plot aimed at the heart of the Arab nation, whose beating heart is Damascus. We had our differences with Arafat who made peace with the Zionist entity, but his assassination clearly served their interests.” Poirot times his next question, “But you yourself negotiated at length with the Israelis. Wasn’t it in your interest to remove Arafat?” Poirot starts to think about Assad’s moustache. “Look, who killed Jesus? We both know the answer to that. And it’s the same answer in this case.” Assad’s rhetorical answer amuses Poirot. The Romans could hardly have murdered Arafat, he jokes to himself. Back at the hotel Poirot tries a local tisane as he reflects on the events of the day. The aromatic flavours wake up his senses, this is good he thinks to himself, I must remember to take some back with me. He was confident that every single person he talked to today had lied to him. Any of them could have been the murderer and perhaps two or more of them had colluded to carry out the assassination. Poirot’s task was to bring order to these chaotic situations, strip away the distractions and voila there’s the truth. It won’t be the case this time, the great detective accepts with resignation. He arrives at a conclusion that many before him had stumbled upon. Reason and the Levant aren’t easily reconciled. Unless someone saw a fat man leaving Arafat’s house on the night the poison was administered, we shall never know the truth, Poirot chuckles to himself.